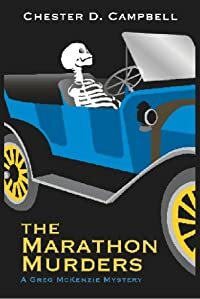 The Marathon Murders by Chester Campbell: Synopsis and Online Purchase Options. Synopsis (from the publisher): Greg and Jill take on what appears to be a 90-year-old murder case, dragging them into a present-day conspiracy filled with chicanery in circles of power and chaos created by a frenzied killer. It starts with a stash of yellowed records found during restoration of the long-defunct Marathon Motor Works' buildings in Nashville. The documents vanish, and the construction foreman who had them is murdered. The McKenzies' clients, Col. Warren Jarvis (who first appeared in Secret of the Scroll) and his girlfriend, Kelli Kane, believe the records would shed light on the fate of her great-great-grandfather. A Marathon officer who disappeared in 1914, he was accused of embezzlement and later found dead. More murders occur, appearing aimed at suppressing the secret behind the missing records. It's a tale of greed, misplaced pride, family loyalty, and the unpredictable violence of an irrational mind.